Destroyer ship "USS Liberty", SAM systems, radar sites, and more. Entering its fifth year of post-launch support, Bohemia Interactive today released the 81st platform update for its combined arms tactical military shooter, Arma 3. 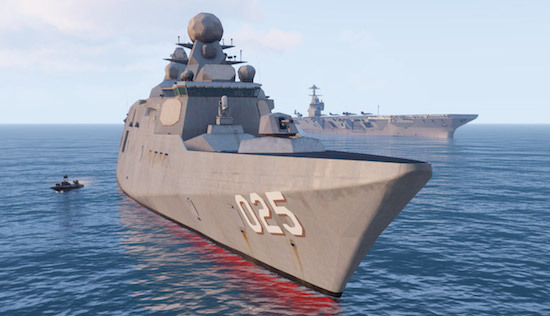 The Encore Update (1.84) delivers a wide variety of free new bonus content to all 4+ million Arma 3 players, such as a NATO destroyer ship, surface-to-air missile systems, radar sites, missiles and bombs. The free new content, which was created by third-party developer BRAVO ZERO ONE Studios (co-developer on last year's Jets DLC), enables players to enjoy more diverse and immersive scenarios, while introducing more balanced options for ground-to-air combat and vice versa. Added: An ability to export editor scenarios to SQF script. Calling such script will dynamically recreate the scenario (known issues: waypoints cannot be attached to objects / position randomization of objects by connecting them to markers doesn't seem to work correctly).